Since the 1970s I have cherished a book called Minds in the Waters and carried it with me everywhere, even when i lived in the back of a pickup truck in Big Sur and only had very few books with me. 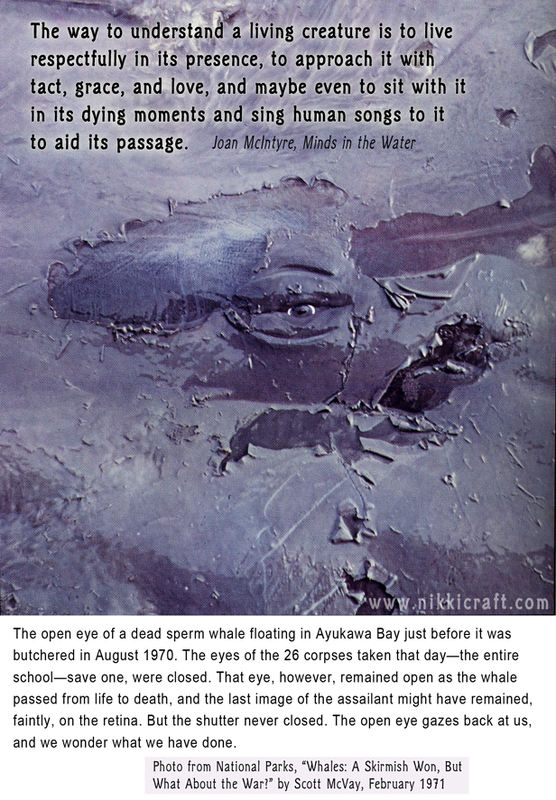 This haunting graphic and these words helped formulate my awareness about whales and dolphins at a very early age which began when i saw a play on the Public Broadcasting Station in Dallas Texas in the 1960s. The play was about an employee who tended a dolphin being used for military experimentation. The man, after going thru the ethical dilemma he was facing, I am pretty sure had decided to free the dolphin, who resided in a casket side container not much larger that his/her body, I was in my late teens and i had no doubts about who my alliance was with and it wasn't with the military.